Even more reasons to love your state parks! We are now accepting submissions for content! Is there something you would like to share with us? Is there something you would like to know or learn about? Stories, photos, information requests, etc. Click on the blog title or the image to be directed to the post. We are always looking for new content. 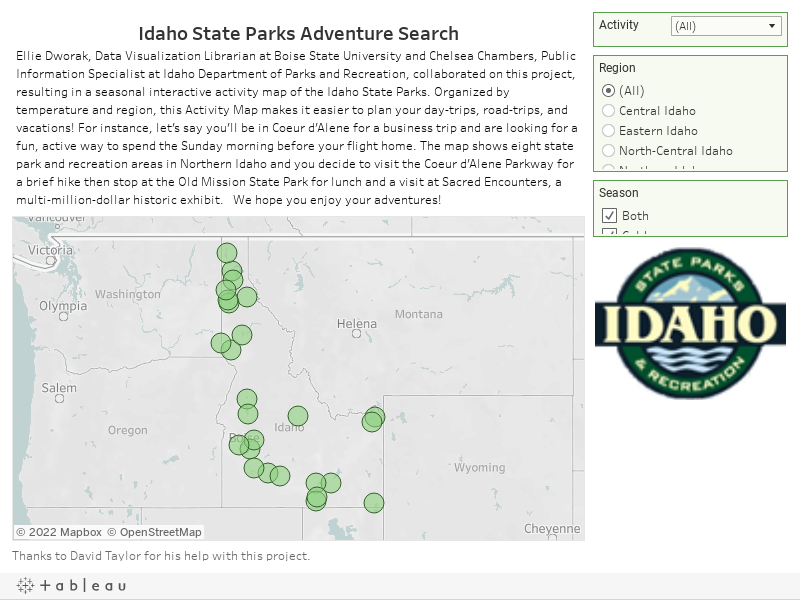 Introducing The Idaho Adventure Map, an even easier way to plan your Idaho State Park vacations! - For example, you want to find all parks in South-Central Idaho that host a Junior Ranger Program. After making your selections, you'll find that City of Rocks, Castle Rocks, and Massacre Rocks all have a Junior Ranger Program in your area. Be sure to read the complete list of activities for each park you select. For example, if you selected Junior Ranger and Fishing in South-Central Idaho, then Lake Walcott will appear, because it has Fishing as an option, but not because it has a Junior Ranger Program. The Activity Selections will be for any park that has any of your preferred activities. The historic use of "flying discs" has been noted throughout the world, so it is difficult to pin point exactly when and where disc golf started. What we do know, is that in 1976 "Steady" Ed Headrick started the Disc Golf Association and is coined with the popularity of modern disc golf and many frisbee sports. Idaho state parks are jumping on the disc golf train and new courses are popping up all over the state. Spring has sprung and with it comes flowers! The blooming of plants and wildflowers is undoubtedly one of the most magical parts of spring. Wildflowers can be found at any of your Idaho state parks and recreation areas. Castle Rocks State Park Manager, Wallace Keck, has been posting images of wildflowers as the bloom in the park. To see his recent posts, visit their Facebook page by clicking here. Many parks host events featuring wildflower hikes, crafts, and more. Check back to this page frequently for an updated list of wildflower related events. Fishing season is here! Well, if you haven't been ice fishing all winter... then fishing season is here! Did you know that Idaho has more than 26,000 miles of rivers and streams, along with 3,000 natural lakes, and more than 250,000 acres of ponds and reservoirs? That's a lot of fishing! But before you go, make sure you have everything you need to legally fish in Idaho. Visit Idaho Fish & Game's webpage for a list of fishing requirements. Fish Stocking: Idaho Fish & Game stocks over 30 million fish per year, for an updated stocking schedule, click here. Are you ready to dust off that motorbike that's been sitting in your garage all winter? We are too! But before you hit the trails (on your motorbike, horse, bicycle, or feet! ), be sure to check the conditions. Spring means rain, rain means mud, and mud can mean trail erosion. This could lead to the destruction of both the trail and the surrounding environment, especially when you're toting heavy ATVs and four-wheelers. This is the perfect time of year to take a FREE Motor Vehicle Safety Course. These courses are hosted state-wide, all season long. For a complete list of upcoming classes, click here. For more information on Off-Highway Vehicles, visit the webpage. Looking for a new place to ride? Check out our Online Trail Mapping System here. Recreation in Idaho State Parks varies by season. The nine-month reservation window is now open, meaning you can book stays for up to nine months in advanced. Don't waste your time worrying whether you're going to get a campsite or not--plan ahead and have one ready when you get there. We have tent and RV sites, cabins, houses, and yurts available year-round (weather dependent) so no matter what kind of camper you are--there is a campsite for you. Reservations can be made toll-free by phone at: 1-888-922-6743 (Agents are available 7 days a week, Monday-Friday from 8:00am - 7:00pm Mountain Standard Time and Saturday & Sunday 9:00am - 5:00pm Mountain Time) or online here. With warmer weather comes a whole myriad of activities to try. We have compiled a list of some springtime adventures for you to try out on our blog site. Click here or the image below to be redirected to the blog post. The Idaho Department of Parks and Recreation's Trail Map program is a mapping application that offers printable maps of trails for hikers, bikers, Nordic skiers, and motorcycle and ATV riders. Hiking trails fall under the non-motorized category and are designated by a red-dashed triangles. Click here to access the program: http://trails.idaho.gov.